THE SING-OFF: Season Two Sneak-Peek of A Cappella Groups! R&B, contemporary, jazz, soul, modern, classic, and pop are the styles of music that make-up the ten groups performing a capella music on the stage of “The Sing-Off”. 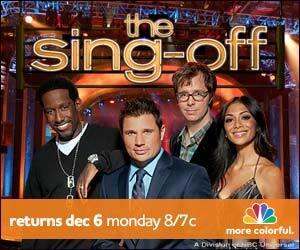 The second season of the singing competition will premiere Monday, December 6th at 8/7c. Celebrity judges Shawn Stockham (Boyz II Men), Ben Folds (Ben Folds Five), Nicole Scherzinger (The Pussycat Dolls) and host Nick Lachey (98 Degrees) will return. This season, the show decided to film all, except the final episode, in advance. That’s right all of the shows, EXCEPT the final one which will air live when the winner is announced. The shows wrapped sometime in late September or early October. By contrast, last season’s shows aired soon after they were filmed. This brought in a high number of studio audiences that included some celebrities. This season will present some heavy hitters in the groups that will be performing on stage. They are well versed in styles and many holding several awards and honors. YouTube viewers will be happy to know, that “On the Rocks” from Eugene, Orgen is part to the ten groups performing. The all-male group is well-known for their viral sensation rendition of Lady Gaga’s “Bad Romance” video which got 6.5 million views. The Backbeats (Los Angeles, CA), are twenty-somethings who are named the best a capella singers from University of Southern California and University of California Los Angeles. They have a mix of Pop, R&B and Soul. Eleventh Hour (Kettering, Ohio) is one of the nation’s top high school a cappella groups. They’ve won two Contemporary A Cappella Recording Academy awards, and have opened for LeAnn Rimes, The Beach Boys and sany backup for Kenny Loggins. Pitch Slapped (Boston, Massachusetts) is a group of students from Berklee College of Music. They have won numerous International Championship of Collegiate A Cappella awards, including their recent triumph of 2nd place overall. Groove For Thought (Seattle, Washington) is a unique brand of jazz and R&B. Winner of the National Harmony Sweepstakes Championship and the Contemporary A Cappella Recording Award for Best Jazz Song (2006), they have entertained at festivals, concerts, schools, and nightclubs throughout the country and abroad. Men of Note (Cherry Hill, New Jersey). This all-male group of eight is comprised of Cherry Hill High School West alumni, where the group was first founded. They are three-time winners of the Best Of High School A Capella competition. Street Corner Symphony (Nashville, Tennessee) is a southern style gospel group. They are a group of six with two sets of siblings. All from the Southeast U.S., they maintain a rich gospel sound. Committed (Huntsville, Alabama) is another all-male group in the competition this season. They group of four met singing together in high school at Forest Lake Academy, and continued in college at Oakwood University in Huntsville. Jerry Lawson & Talk of The Town (Oakland, California) Jerry Lawson, of The Persuasions for 40 years joined Talk of The Town while performing at a wedding. The group has performed with Rod Stewart on the Katrina Benefit, and Nickelodeonâ€™s Noggin Network on â€œJackâ€™s Big Music Showâ€. The Whiffenpoofs of Yale (New Haven, Connecticut) are 14 senior Yale men. The “Whiffs” were founded in 1909 being the world’s oldest collegiate a cappella group. A group of international acclaim, they tour for three months with dozens of foreign stops. Expect to see them sing modern hits along with classics!